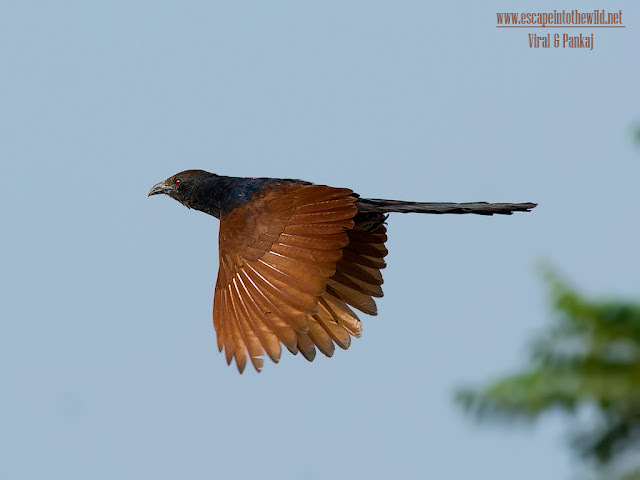 They are large, crow-like bird with a long tail and shiny coppery brown wings, found in wide range of habitats from jungle to cultivation and urban gardens. They are weak fliers, often seen clambering about in vegetation or walking on the ground as they forage for insects, eggs and nestlings of other birds. Therefore, it’s difficult to get the flight shot of this bird and also we saw many roadside accidents of this bird while crossing busy road. We saw many times dead body of Greater Coucal over road due to these unfortunate accidents. We frequently visited Narmada canal at Dharpur, Patan for bird photography. It is comparatively large canal full of flowing water so if any bird wants to cross it than it has to fly. Due to that we get chance to the click this bird in flight. Finally, we got the photo of Mr Lazy Flier in flight.